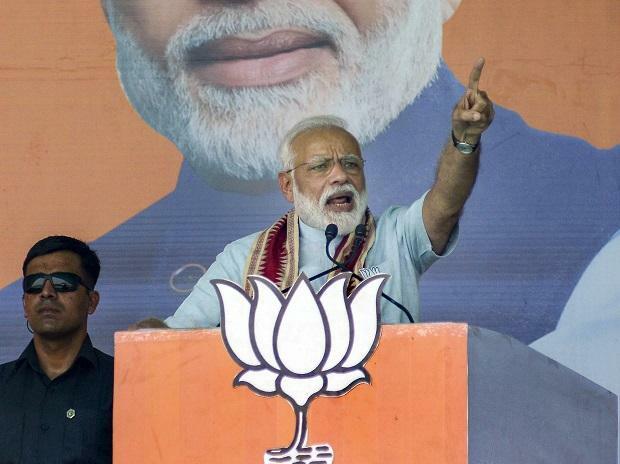 Addressing a rally in Junagarh in Gujarat, Prime Minister Narendra Modi on Wednesday said his government had worked to bring the corrupt to the doors of jail in the last five years and if he was given another chance, they would be inside. “In the last five years, I have brought them (the corrupt) to the doors of jail. If given the next five, they will be inside,” Modi said, targeting Cong leaders. Modi claimed that the Congress in its poll manifesto has said everybody should get bail even if they commit a serious crime. “For whom is this provision, is it for your leaders?” he said. Modi tore into the Congress, accusing it of a "Tughlaq road election scam" in which, he claimed, money meant for the poor and pregnant women was "looted". Congress President Rahul Gandhi's official residence is on Tughlaq Road in New Delhi. He took a swipe at the Opposition party, saying it was known by many names as far as scams are concerned. “Now, it has got a new name, but with proof. The Congress is indulging in a ‘Tughlaq Road Chunavi ghotala (election scam)’, in which money meant for the poor is being usurped for their own leaders. Money meant for pregnant women is looted,” Modi said.